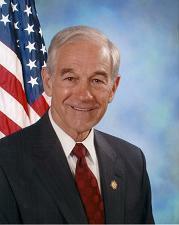 Not linked on Ron Pauls Congressional website. The SPEAKER pro tempore. Under a previous order of the House, the gentleman from Texas (Mr. PAUL) is recognized for 5 minutes. Mr. PAUL. Mr. Speaker, today the Federal Reserve lowered interest rates by a half a percentage point. They have been asked to lower this interest rates by just about everybody in the country. Whether they are investors or politicians, everybody literally has been screaming at the Fed and Alan Greenspan to lower the interest rates, lower the interest rates. It was anticipated that he would, and he did. He lowered the interest rates by 50 basis points. The stock market promptly went down 236 points. So obviously just lowering interest rates is not the solution to the problems we face. As a matter of fact, I believe it is the problem. Interest rates have been manipulated by the Federal Reserve as long as I can remember, especially in the last 30 years since we have had a total fiat monetary system. So it is the manipulation of interest rates that causes a problem. In a free market economy, you do not have a central bank pretending it has knowledge it does not have, that it knows exactly what the money supply should be and what interest rate should be. That is a prescription for disaster; and it leads to booms and busts, speculations in the stock markets, crashes in the stock markets. This is a wellknown phenomenon. It has been with us since 1913, since we have had the Federal Reserve. We have seen it in the speculation in the 1920s and the depression of the 1930s. It is ongoing. We have a responsibility here in the Congress to deal with this. We have a responsibility to maintain the integrity of the money. Yet we up that responsibility to a secretive body that works on its own, deliberating and deciding how much money supply we should have. To lower interest rates, a central bank has to increase the money. That is debasement. That is devaluing the money deliberately. In the old days, when the king would do this, they would clip coins. Literally coin debasement, stealing value from coinage in the old days was a capital crime. Today, though, it is accepted practice in all economies of the world. We have had no linkage of any currency of the world in the last 30 years to anything of real value. The economies have functioned relatively well. But just in the last 6 years, we have had eight financial international crises, all patched together by more inflation, more printing of more money. Let me tell my colleagues, I am convinced it will not last, it will not continue. Take a look at what is happening in Japan today. Japan lowered their interest rates, too. They have been doing this for a long time. They are down to 0 percent, and nothing seems to be happening. Their stock market is at a level it was 16 years ago. We have to decide whether or not we may be moving into a similar situation. I think it is a very serious problem. We talk about interest rates. We talk about stimulating the economy. But we really do not talk about the problem, and that is the monetary system and the nature of the dollar. The money supply right now is currently rising at the rate of 20 percent, as measured by MZN. This is horrendous inflation. This is inflation. Everybody says no, there are reassurances. The Federal Reserve and all the statisticians say there is no inflation. The CPI is okay and the PPI is okay. But there is inflation. Because if one increases the supply of money, one is creating inflation. The most important aspect of that is the instability it creates in the marketplace. It does not always lead to a CPI increasing at 10 or 15 percent. Our CPI is rising significantly. We have other prices going up significantly, like education costs and medical care costs, housing costs. So there is a lot of inflation even when one measures it by prices. But the real problem with the inflation when one allows a central bank to destroy its money is twofold. One, it creates an overcapacity or overinvestment, excessive debt that always has to be wiped out and cleaned out of the situation, or economic growth cannot be resumed. Japan has not permitted this to happen, and economic growth has not resumed. That is the most important aspect because that causes the unemployment and that causes the harm to so many people. Now, there is another aspect of inflation, that is the monetary debasement that I have great concern about. That is, when it goes to extremes, it inevitably wipes out the middle class. It destroys the middle class. We are just starting to see that happening in this country. Low middle-income earners, individuals who are still not on the dole but willing to work, they are having a tough time paying their bills. That is the early stages of what happens when a currency is destroyed. Last year, for the first time in our history of keeping this record since 1945, in 55 years, the wealth of the American people went down 2 percent.